Treat yourself to the luxurious P smart 2019 – boasting a Dewdrop display, dual AI cameras and superb performance wrapped up in a premium, stylish finish. 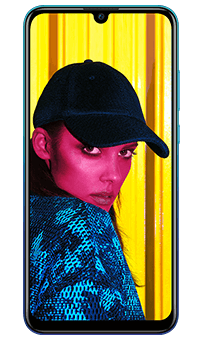 Explore a world of vibrant colours with the Huawei P smart's 6.21" FHD+ display. Rocking an 80% screen-to-body ratio, the P smart takes your viewing experience to the next level while also keeping your eyes safe, thanks to Rheinland's eye protection certificate. See the beauty in every setting thanks to the P smart's dual AI cameras. Composing the perfect shot has never been so easy – with a 13 and 2 MP rear and 8 MP front camera aided by scene recognition, you can choose from over 500 settings across 22 categories. Witness beauty fused with elegance – the Huawei P smart sports a premium ceramic-like texture with a curved design. Complete with a droplet-like notch, the P smart is a fashion statement you'll want to get your hands on. Get more done with the P smart 2019 – thanks to Huawei's Kirin 710 highly responsive octa-core processor, multitasking feels smoother than ever. Boosted by a 3,400mAh battery, you can keep going without a charge, even during the busiest days.